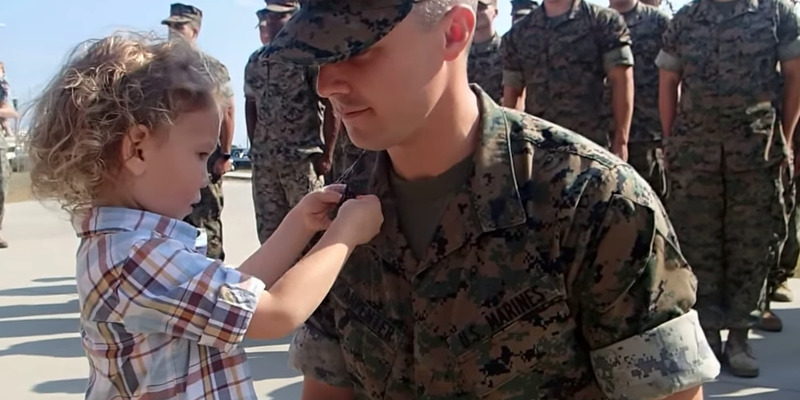 A US Marine was promoted to sergeant, with his son appearing to pin on the emblems of his new rank. Being promoted within the US military’s noncommissioned officer rank is a special occasion in a service member’s career, after which they are entrusted by their commanders to lead junior enlisted service members and are assigned more responsibilities. One Marine marked the special occasion with what appeared to be his 3-year-old son. In a video posted online last year, a newly minted Marine sergeant marches to the front of a formation for his promotion ceremony, standing at attention as a senior Marine reads out a commander’s order outlining his new responsibilities. After the order was read out, a child approaches the formation and says, quietly, “good afternoon, gentlemen,” before the promoted Marine kneels so the child can remove his chevrons and pin on the emblems of his new rank. The two share an embrace before the son scurries away.